4 years after the DVD Live@Shrine, Femi Kuti returns with a generous, powerful and timeless new album, continuing to explore and push back the frontiers of Afrobeat. 13 titles that grab your belly, your feet, your heart and your head. From the ghettos of Lagos to the palaces of corrupt politicians, Day by Day takes us through the winding roads of African paradox. Why is such a rich continent inhabited by the world's poorest people?…. Copying note for note his Father's music has never been Femi's goal. If he accompanied Fela's musicians during his youth, he decided as early as 1986 to free himself up and create his own band. Whilst always respecting his musical heritage, Femi has refined over more than twenty years, an afrobeat with soul-jazz nuances that is entirely his own. The route taken has always been original, from his signing with Motown in the early 90's until his ground-breaking album in 2001 "Fight To Win", for example, when he joined with rappers Mos Def and Common and funkmaster James Poyser, amongst other American luminaries. These rich experiences only served to re-enforce his ultimate conviction; his music has never been as intense as when brewed in a Nigerian cauldron and matured in the hot-house atmosphere of the Shrine - his Lagos nightclub. Serving as an African laboratory the Shrine is an open house for the dispossessed, a meeting point for popular dissenters whilst also being a centre for celebrating the convergence of cutting-edge African music and dance. In brief the Shrine is a place that disturbs the country's politicians and authorities. The State's militia make regular punitive expeditions carrying knives and baseball bats. Last Spring they came in the middle of the night, broke their way in and injuring several people without any apparent reason. Nigerian media, in thrall to a gangrenous corrupt government continue to ignore these attacks. Only a few lines in the international press bear witness that these gratuitous and violent roustings that are never explained take place. Could it be because Femi had plastered posters all over the town reclaiming the return of electricity in his miserable neighbourhood and inciting his neighbours to revolt against the ever-deteriorating conditions that are prevalent in their increasingly precarious lives. Or is it simply because of the latest haranguing refrain of songs like "Tell Me" which is found on this album. 1n any event these persecutions recall and confirm an unshakeable fact; Afrobeat emanating from the Kuti family is above all else a music of combat. Immortalised in Femi's "live" DVD in 2004 ("Live At The Shrine" MK2/Uwe) he hoped to expose in a raw and savage fashion this reality. Three years later this album launches another challenge, to re-create in the studio the magic and burning energy of a Femi Kuti concert. Three tracks from the "live" have been re-interpreted for the occasion. Telling it like it is; This is perhaps the finest work amongst Femi's discography. These twelve tracks offer a more focussed Afrobeat than ever before, recorded with his Producer, Sodi, this album benefits from a complicity that has grown ever stronger over the past twelve years. 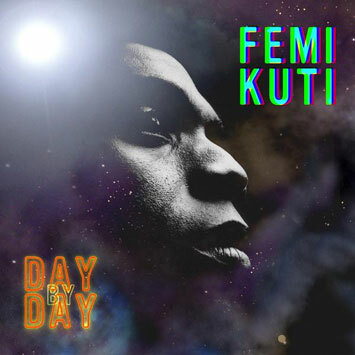 "Day by Day" is Nigeria in all of its states: We find elaborate instrumental patterns, both in their texture and in their structure ("Demo Crazy") refrains as soulful as the best old hits Curtis Mayfield hits ("Eh Oh") and hot numbers to set light to any dancefloor. His group, Positive Force, built the foundations in Lagos and, during timely visits during sessions in Paris, other artists brought their building blocks to the structure. Keziah Jones made his guitar swing on "Tell Me" and "Dem Funny".Femi's young son, Madé, also joined the adventure, participating in all the tracks on this delicious album – to be released on the 27th October.